I was more interested in the Sim City and Rollercoaster Tycoon games back in the day, so I didn’t actually play Theme Hospital until a few months ago. I found it quirky and entertaining, but without nostalgia glasses, it didn’t hold my attention for long, and I wondered what a modern remake of it might be like. Well, here we are. Two Point Hospital manages to faithfully recreate the feeling of Theme Hospital, while bringing the genre into the modern age. The gameplay loop is pretty simple at first glance. Patients with a variety of ailments come into your hospital where you are expected to have a reception area waiting for them, and soon they are on their way through what could very well become a lengthy series of appointments with various doctors and nurses performing every kind of diagnosis imaginable and hopefully, eventually, a treatment will be applied that leads to a cure. Along the way patients have various needs that need attending, not unlike The Sims, including bathroom, food, water, boredom, cleanliness and comfort. Meeting all these needs requires persistent placement of amenities throughout the hospital, and there is some depth to the strategy of their placement. Things become complicated as the number of ailments increases and the need for additional facilities becomes greater. The player not only needs to build each facility by hand, but also has to staff them. Managing staff becomes complicated as every doctor, nurse, assistant and janitor has their own skills and needs. They also have to take breaks, so peppering break rooms throughout your hospital and hiring additional seemingly redundant staff becomes absolutely essential to preventing your offices from becoming unstaffed. Staff can also be trained to learn new skills, but have a limited number of skill slots, so it may seem like a good idea to hire that doctor who has 5 unique skills until you realize it might make more sense to hire a doctor with 1 skill, and then build upon that skill 4 times rather than hiring a jack of all trades. Once your hospital is up and running you will certainly enjoying watching the people meander about with their bizarre afflictions, which include a wide variety of fantastic diseases such as Mime Crisis, Mock Star and Potty Mouth. It’s always fun to see a person suffering from Jest Infection get dehumorified so that he or she no longer resembles a clown. 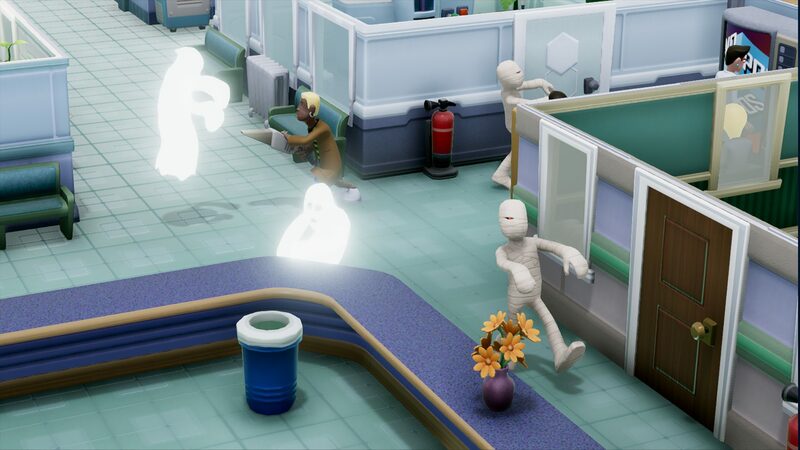 Two Point Hospital constantly offers the player various challenges, such as accepting a large number of patients all suffering from the same ailment, which can stretch your hospitals’ resources to their limits. When things get out of control, they really get out of control, with everyone and their mom vomiting all over the floor and ghosts of dead patients chasing the living around the sick. Recovering from such chaos is difficult, but not impossible. Assuming you’re not broke (and even if you are you can take a loan), hire a bunch of extra janitors and figure out which lines are too long and build additional facilities to meet demand. With any luck things will calm down and you can get back on track. Features unlock slowly in Two Point Hospital as you go from stage to stage. Eventually you have to start dealing with hot and cold climates, natural disasters, advertising campaigns and more. The problem is that I found myself a bit bored before I could get through all of the levels to unlock everything. Though the main gameplay loop is fun, and made better by some really hilarious and charming character animation, it doesn’t hide the fact that a lot of what you do in Two Point Hospital is recreate the same rooms over and over. The most notorious example of this is the General Practitioner’s office. If you play the game by constantly responding to patient demand, you will quickly notice lines in front of the GP’s office, and find yourself building more and more of them. By the time you’ve placed your 5th GP’s office in a single hospital, including hand-placing every door, chair, desk, lamp, and even artwork for the walls, you might be a bit tired of doing it. Then as you realize you have to do this again and again for every stage on the map, things just get a bit old. Templates would have gone a long way here. And so, after getting 3 stars in 6 different hospitals over the course of nearly 15 hours and facing the big empty building that started the next level, I had had enough. My time in Two Point Hospital was enjoyable, but the fun didn’t quite last for the long term. Nevertheless, I am thrilled that Two Point Studios decided to make this game, as it is without a doubt the definitive game of this genre. I’m sure that fans that did play Theme Hospital back in the day will nod approvingly while playing this game, especially while listening to the announcements played on the loud speaker, which really feel like they could have been pulled right out of 1997. I very much look forward to future projects from Two Point Studios! Ari played 15 hours of Two Point Hospital, completing 6 stages. He received a copy of the game for review purposes from SEGA. I played Prison Architect for a while and need a new business simulation fix. This looks like it could hit the spot! In some respects, the lack of long-term appeal isn’t a big deal for me, because I have a notoriously short attention span for games like this.